I finally took our OWN family portrait! How I took the shot with just my camera, lens, tripod and phone. Today was a special day for the Cable family. We actually had both kids in town and had the whole family together for once. Since I have been taking all of our friend's family portraits for the holidays, I figured that it was about time that we get one of our own family. I mentioned this yesterday and my daughter suggested that, with the Olympics coming up and us having all this USA clothing, we use this as a theme. I loved the idea and so this is what we did. But it was just us, and even though I have some photographer friends in the area, I did not want to bother them to take the photo. I was trying to figure out the best way to take the photo, when I remembered that the Canon 5D Mark IV has WiFi and can be mounted on my Gitzo Mountaineer tripod and easily triggered from my iPhone X. Because the Canon CameraConnect application (which is free) allows me to make changes to the aperture, ISO, shutter speed and more, I was able to determine the proper settings while in the posing for the shot. And one feature of the app that REALLY helped, was being able to see what was in the viewfinder. I can't tell you how many times I have tried using a wireless trigger only to find out that the composition was not good. With the CameraConnect app I could look at the live image on the screen, and move us around before hitting the shutter release button. 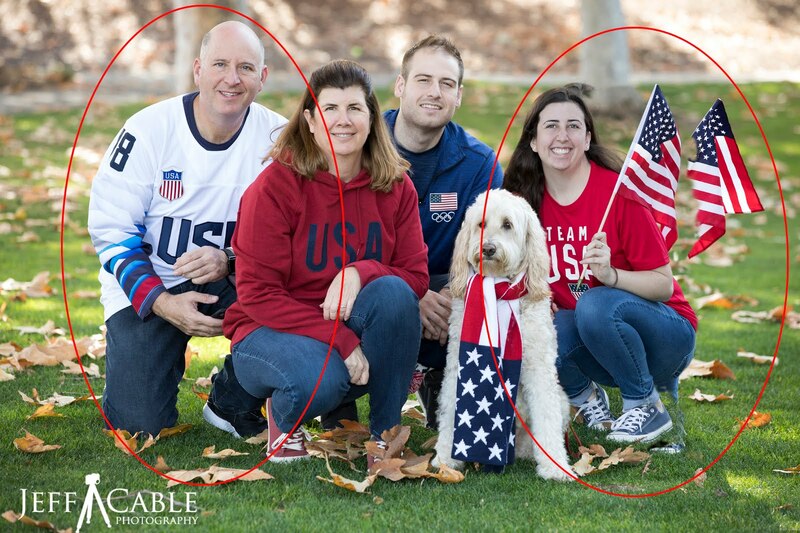 There were numerous times when I noticed that my head was out of the frame or that the flag that my daughter was holding was partially out of the shot. I set the camera to a 2 second timer so that I could hit the shutter button on the app and then hide the phone and look up before the photo was taken. 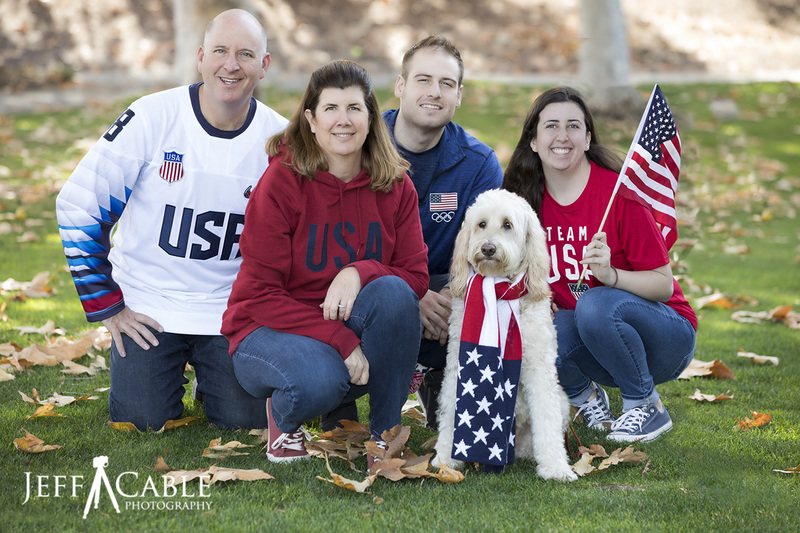 I took 17 photos, using the Canon 5D Mark IV and Canon 70-200 2.8 lens, to make sure we had one with everyone looking good (including the dog who was looking everywhere but the camera). As I usually do, I had my Canon 600 EX-RT flash on the camera and set to -1 stop of flash power. Once I got home and looked at all the images on my computer, I determined that one photo had the best composition, but that I looked better in another photo. If you look at the partially retouched image below, you will see the original photo of me, with the iPhone clearly visible in my hand). 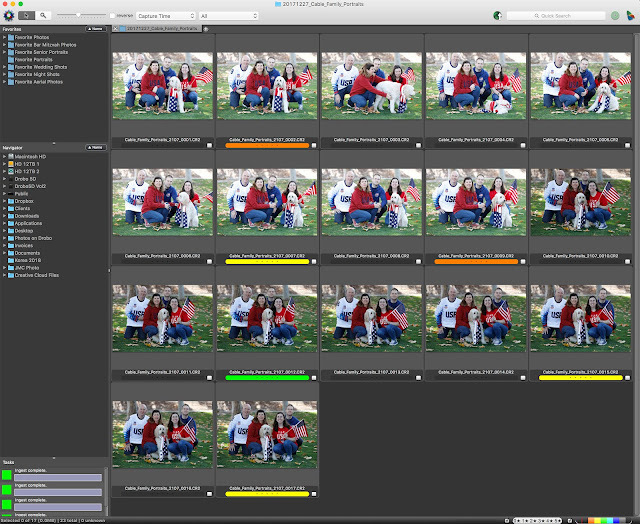 Using Adobe Photoshop CC, I took myself from another photo and cloned it into a separate layer in the main photo. I thought I was done, but then my daughter pointed out that she did not like her pose (and we all agreed). So I then took her from yet another photo and dropped her into a layer of the image. For both of us, I created a layer mask and painted us into the scene. If you look at the image above you will see my original pose and my daughter as I was halfway done masking her into the image. The layer masks did the trick and I was all set. Voila, we had our first family photo in a long time! Here is the final photo. We now have a holiday photo to share with all of you. We hope you like it. Happy New Year from the Cable Family! Have you ever tried using your camera's auto focus micro adjustments for your lenses? * I have never really used the microadjustments before, so do I need this? * The software sounds really interesting and if it can painlessly help me fine tune my lenses, I am interested in knowing more. I have to admit that testing this solution was not too high on my list as I entered the holiday season and am in preparation mode for the upcoming Olympics. But last weekend I had a little free time and decided to give FoCal a try. What I found was quite interesting. Let me start by discussing the camera's ability to make micro adjustments to your lenses. Over time, your lens may start to fall out of calibration and your focus may end up being slightly off. I remember having this problem with my Canon 70-200mm 2.8 IS II lens at the 2014 Winter Olympics in Sochi. My lens was back focusing (which means that it was focusing a little behind my subject) and not tack sharp on the athlete I was trying to capture. Since Canon Professional Services is at every Olympics, I gave them my lens to have them calibrate it (while using one of their loaners in the mean time). But since most of us do not have CPS reps hanging around our homes or studios, we may have to do some of this work ourselves. 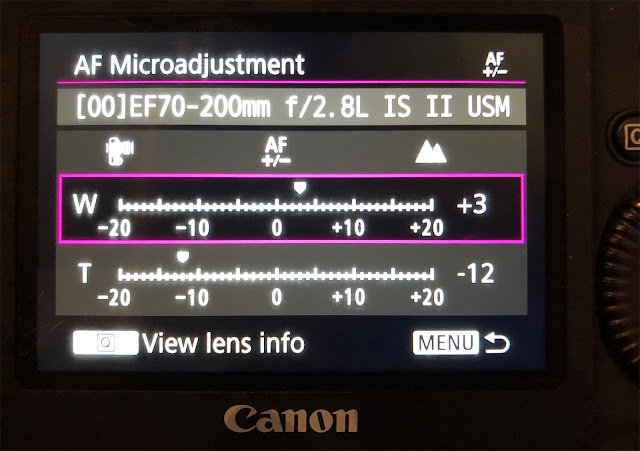 Inside most DSLR camera menus, you will find a menu option called "AF Microadjustments" (it si called this on Canon cameras - it may be AF fine-tune on your Nikon camera). 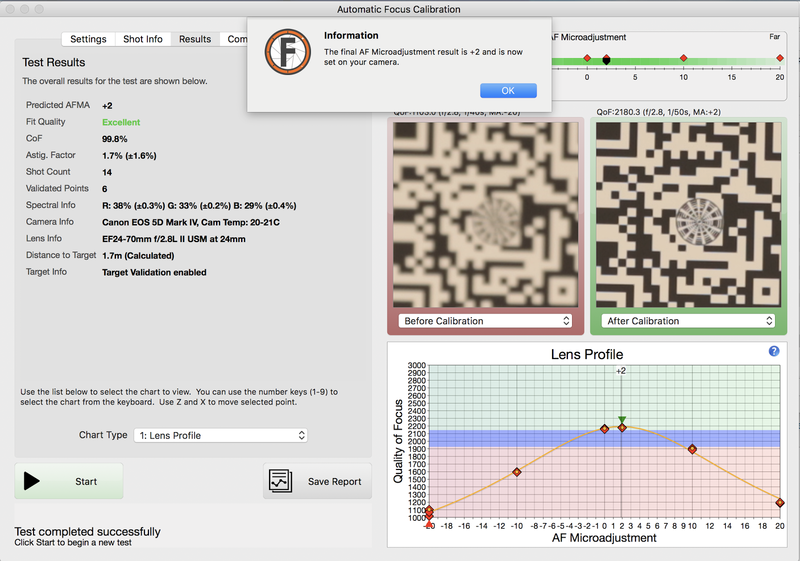 Inside this menu, you can fine tune the focus parameters of each lens that you own. If you have a zoom lens, you can make adjustments to the wide end and the telephoto end of the lens. The goal is to make these micro adjustments so that your lens is giving you the absolute sharpest images you can get. Do I need to use this software to make micro adjustments to my lens? Before I talk about the FoCal software, let me first tell you that you can make micro adjustments to your lenses manually. The cheapest and easiest way is to lay a ruler out on your table, put your camera and lens on a tripod, and then, when shooting down the length of the ruler, focus on a specific mark (ie. the 2 inch marker). You take a photo, zoom in on it, and look to make sure that your focal point is tack sharp and not the area directly in front or behind your spot. How does the FoCal software work and is it better than the manual method? First, I installed the software on my desktop Macintosh. 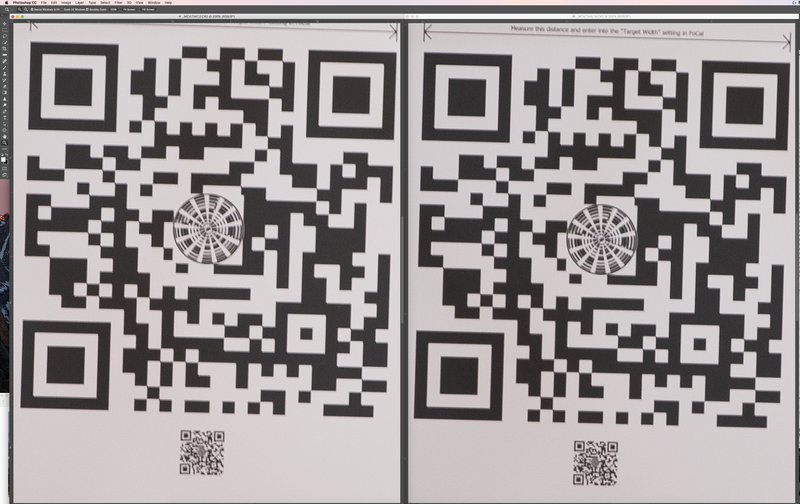 After installing the software and reading the instructions, I went to their web site, downloaded their target and printed it on my Canon Pro-1000 printer. Like they recommended, I printed the target on matte paper so that glare would not be an issue. I then set up the software and prepared to connect the camera to the computer via a USB 3.0 cable. It was at this point that I realized that it would be easier to install the software on my Macbook Pro so that I could move the computer around with the camera as I performed the tests. I then installed the same software on my laptop and prepared for the tests. I should mention that the software runs on both Macintosh and Windows machines, and does work with both Canon and Nikon DSLR cameras. One of the things that FoCal does really well, is give guidance for doing a proper lens test. 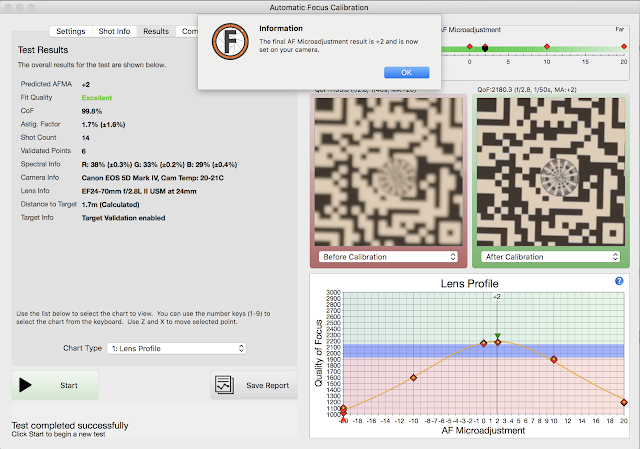 The software will evaluate the distance between the camera and target, as well as determine if there is enough light to perform a lens calibration with good results. When I first started testing the software, it was in the evening and there was not enough light on the printed target, so I waited until the next morning to give it a proper try. I started with my Canon 5D Mark IV body and the Canon 24-70mm 2.8 II lens. For the first test, I set the lens to it's widest setting (24mm). With the camera and lens mounted solidly on my Gitzo Mountaineer tripod, and aimed at the center of the target I had printed, I then connected the camera to my laptop using a USB 3.0 cable. The software was smart enough to tell me that the target was the incorrect distance from the camera, so I moved it closer. Then the testing began. 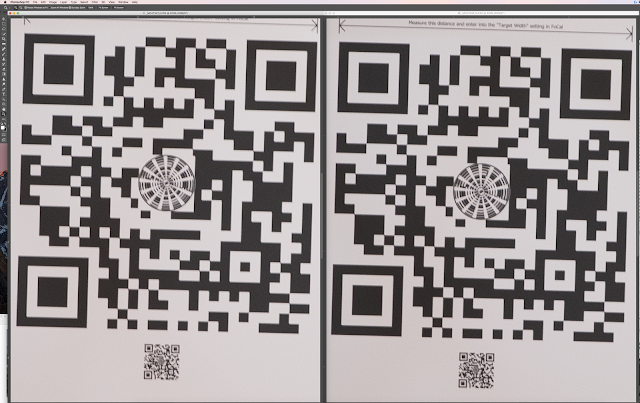 The software took control of the camera and changed many of the settings for the tests. (Note: I was relieved to see that my settings were saved and sent back to the camera at the end of the tests.) It was fun to watch the software firing the camera over and over. Then I would get a dialog box on my Mac as well as a voice prompt telling me how to adjust the microadjustments on the camera. This process repeated itself 4 or 5 times before I was given the recommended microadjustment for the wide focal range of this lens. I then repeated the process at the telephoto end of the lens (70mm). When both tests were done, I then moved on to testing my Canon 70-200mm 2.8 IS II lens, Canon 100-400mm II lens and Canon 16-35mm III lens. And I did all these tests on my Canon 1D X Mark II and Canon 5D Mark IV cameras. After testing my Canon 1D X Mark II with the 70-200 2.8mm IS II lens (since this is my most used combination), I decided to take some photos of the target with the microadjustment set to 0 (like it has been forever) and then set to -12 like FoCal suggested. I then downloaded the images and compared the two photos on my computer to see if the microadjustments helped. 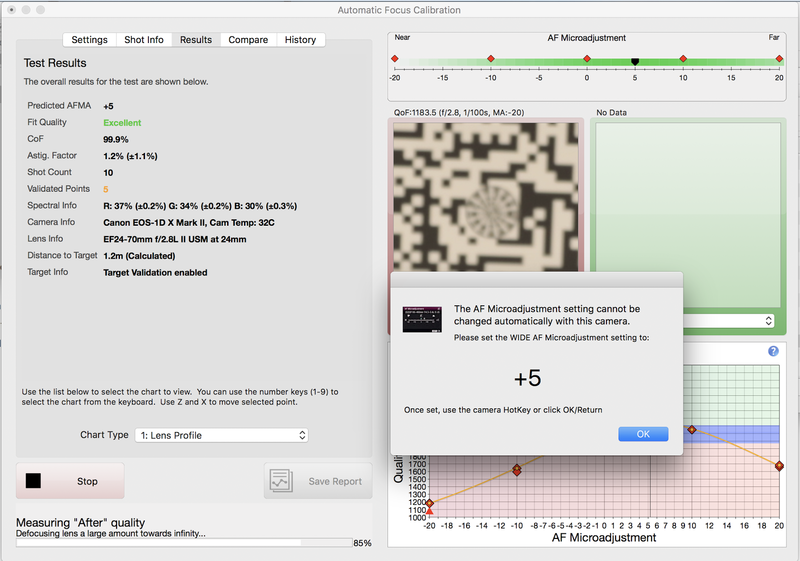 If you click on the image below, you will be able to see the larger image and see the difference between the 0 adjustment (left) and the -12 adjustment (right). Although the differences are subtle, there is definitely a sharper image on the right. And being a picky photographer who wants everything as sharp as possible, this is a good thing. Does this mean that I don't need to have my camera manufacturer adjust my lenses? After going through this exhaustive process, I wondered if this would negate the need to have Canon adjust my lenses (which I usually do whenever I am at an event where CPS is present, like the Olympics or when I speak at the Canon facility in Southern California). After talking to some friends of mine who are pretty technical, I have come to a conclusion. This test will definitely help me get sharp images, but it only tests the far ends of the focal length of the lens. In other words, for a lens like my 70-200mm, I am testing the results at 70mm and at 200mm, but everything in between. Canon is able to make physical adjustments in the lens to get me the very best calibration possible. So...for those times when I have may of my lenses at a CPS event, that will still be my preferred method. But for all those times in between, I think that FoCal will be used to give me peace of mind, knowing that my lenses are giving what I paid for, super sharp images. Are there any downsides to using the FoCal software? As I mentioned earlier, I tested many different lenses with the software and then repeated all of them on each camera body. Because most of lenses are zoom lenses, I had to test each of them at their wide and telephoto focal lengths. This took a couple of hours for me to complete. So, it is not a trivial process. Is the software worth $139? Honestly, in a world where us photographers are spending a lot of money on cameras, lenses, lighting accessories and so much more, I think that this price is very reasonable for the results I got. I paid a lot of money for these cameras and lenses and did so for a reason - I want the best images I can get! Using programs like FoCal will give me a little more confidence that my cameras and lenses are working at their optimum performance. You can purchase the software from B&H photo here. 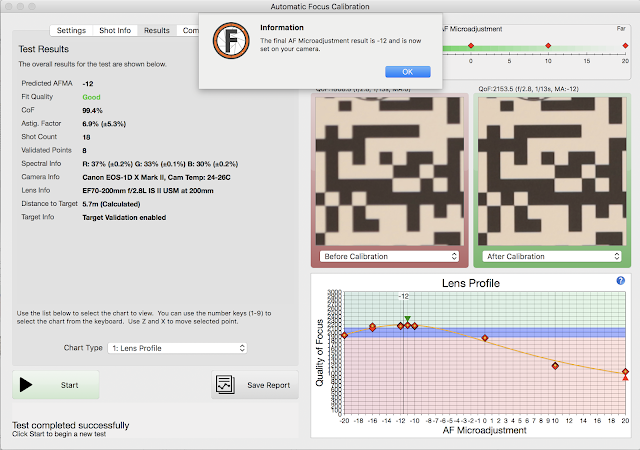 There are different versions of the FoCal software, but I recommend the PRO version since it lets you calibrate lenses beyond 400mm, run extra tests and run and save calibration reports. And I should mention, as is always the case, I have not been paid by the company to write this blog. 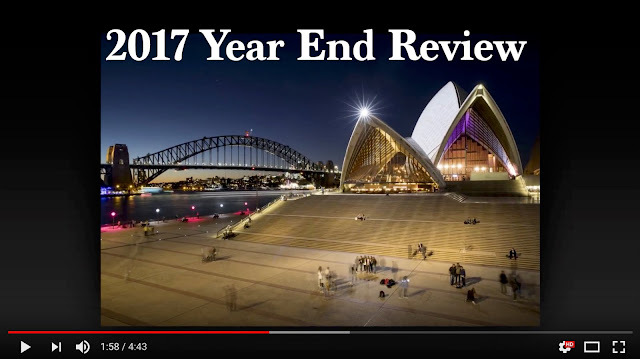 A couple of months ago, I asked all of you to email me with ideas for future blog posts. One of the suggestions that came up numerous times was the request for me to explain all the different memory card formats. 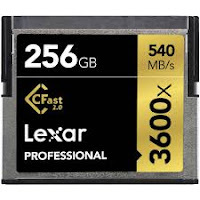 I guess that my 12 years in the industry, marketing memory cards for Lexar, makes me slightly more knowledgable than most photographers about this subject. With that in mind, I am writing this blog post to explain the many different memory card formats, including those from the past, current card formats and what might be the card of the future. 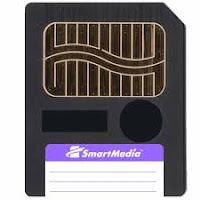 The SmartMedia card goes way back, This was the first memory card I ever used in my first digital point and shoot cameras. The card was paper thin and rather remarkable in it's day. The capacities ranged from 2MB all the way up to 128MB. At the time, that was huge. Today, the larger cards would barely store one image from the current digital cameras on the market. I remember using 4MB and 16MB cards that were produced by Toshiba. It wasn't until I visited Tokyo that I was able to find 128MB SmartMedia cards. These cards are long gone, but still hold a special place in my heart. 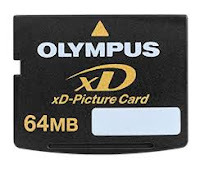 The xD card format is another old card format and was proprietary, and only used by, Olympus and Fujifilm. This card ranged from 16MB to 2GB and was designed as a competitor to the SD card format. Ultimately over time, the SD card format won the battle and xD was phased out. This memory card was very confusing from the outset. The format looked almost exactly like SD cards (without the locking tab), even though they were different. Most camera companies opted not to use MMC as their card format, although there were a few cameras which did rely on this form factor. Before the advent of the microSD card, this was the memory card designed for small products (like cell phones and MP3 players). miniSD was around for a couple of years and then gave way to the more popular microSD card. 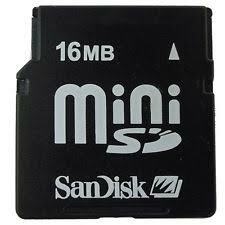 The Memory Stick format was designed by Sony back in 1998 and used almost exclusively by them for their digital cameras, video cameras and gaming devices. Sony used MemoryStick products exclusively until 2010 when they gave up on the form factor and moved most of their products to SD cards. There were numerous types of Memory Stick formats through the 12 years, including Memory Stick PRO, Memory Stick Duo, Memory Stick PRO Duo, and Memory Stick Micro (otherwise known as M2). The Memory Stick Micro cards were designed for smaller devices, much like the miniSD cards of today. 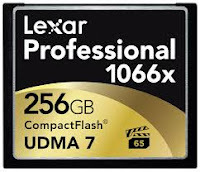 Th CompactFlash card has been around for a long time (since 1994) and is still a very popular card format for DSLR cameras. Canon and Nikon continue to announce CompactFlash (CF) based cameras, and have been using CF cards in their higher-end cameras since the late 1990s. There have been different iterations of the CF card, including Type I and Type II (which were different thickness) and even different speeds (CF 2.0, CF 3.0, CF 4.0, UDMA). Even though this is still a current form factor, you will start to see the end of CF in the years to come. The technology is now older and the maximum card capacity (512GB) and maximum speed (1066x) has been reached. The CF hosts (cameras, card readers...) use pins to connect to the card and they can bend if the card is inserted incorrectly. There is also the problem of particles enter the holes on the CF card connector. Newer cards do not use this antiquated connection and use more reliable connectors. Both Canon and Nikon have continued making cameras with the CF card slots, mainly because of the popularity of the card and the fact that so many photographers still have a large investment in their CF cards. Many photographers, myself included, like the larger size of the CF cards, making them harder to lose or misplace. But, with that said, I was not happy that Canon included a CF card slot in the newer 5D Mark IV. I would have preferred to see a newer faster technology used. 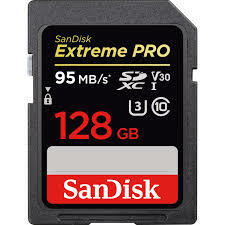 Secure Digital cards (more commonly called SD cards) have been around for almost 20 years and is the most common memory card format for digital cameras. These cards were designed with a locking tab which could be moved to turn the card into a read only device. 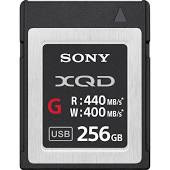 There have been many variations of SD cards over the years (capacity specs called SDHC and SDXC and speed specs like UHS-I, UHS-II and recently UHS-III) helping the technology advance in both capacities and speeds. I remember having a 4GB SD card on my desk at Lexar and everyone commenting on how amazing that capacity was. The truth is, the card was a 512MB card with a fake label on it (for a photo shoot talking about what might come). Now SD cards exceed the speeds of CF cards (2000x) and have reached capacities of 512GB. More than 10 years ago, the SD Association came out with Speed Class Ratings (Class 2, 4, 6 10...) which I have always hated. These class ratings did nothing but confuse customers. These cards are small in size (which the camera manufacturers like) and have continued to keep current with capacities and speeds. 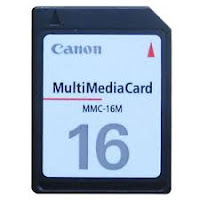 SD cards are used in many of today's cameras, including Canon, Nikon, Sony, Olympus, Fuji and others. 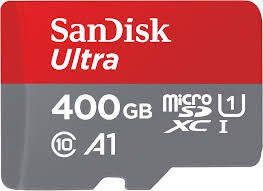 Then microSD format is a variation of the SD card format, but much smaller. These cards are commonly used in compact devices like mobile phones, action cameras and drones where size is a commodity. microSD cards have become the standard for compact sized electronics in the last 10 years. The largest capacity microSD at the time of this blog post is 400GB, which is astounding. It is hard to believe that companies can cram that much NAND memory into a card so small that it can be swallowed. Another card format coming out of the CompactFlash Association is the CFast card. Even though this card starts with the letters CF, and the size is almost identical to CF cards, it is not compatible with CompactFlash based cameras. This is another new card format (like XQD) which offers very fast data transfer rates (up to 600MB per sec) and larger capacities. And also like the XQD cards, there are no pins which can be bent on these cards. Canon was one of the first camera companies to adopt the CFast cards, first in their XC10 video camera and later in their top-of-the-line Canon 1D X Mark II. Other companies, like Blackmagic Design have adopted the technology for their video cameras. I currently use the CFast cards in my 1D X Mark II cameras, both for fast buffer clearing, but more for blazing fast downloads to my computers. 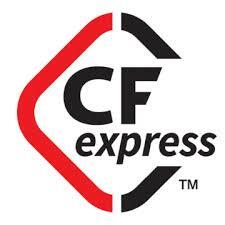 Just like the XQD and CFast formats, CFexpress is a standard proposed by the CompactFlash Association. And like all the predecessors, this card format promises even faster data transfers (anywhere from 2000MB to 8000MB per sec) and larger memory capacities. These newer cards use something called a PCIe 3.0 interface to achieve crazy fast speeds. And what is really intriguing about these cards is that they are the same size as today's XQD cards. This means that Nikon could, by changing their camera firmware, allow all their XQD cameras to utilize CFexpress cards. As of today, there are no cameras on the market which use CFexpress. As a Canon photographer, I would love to see Canon and other camera companies adopt this same technology to once again give all of us a common form factor to invest in. Well...it would not be one common form factor since SD is a standard today, but it would be a future standard for higher-end cameras, offering huge bumps in speed and capacity. Hopefully this helps all of you who are interested the past, present of and future of memory cards. And thank you to all of you who wrote in and suggested the article.